If you do a research,you will find there will be lot of Virtual machine softwares available for both windows and Linux platforms. Today we are going to cover the most widely used Virtual machine softwares for Linux platform. VMware Server (also known as GSX Server) is an entry-level server virtualization software. Vmware also got an ESX Server, which is an enterprise-level virtualization product providing data center virtualization. It can run various guest operating systems such as FreeBSD, Linux, Solaris, Windows and others. Bochs is a light weight and portable x86 and AMD64 PC emulator and debugger. Many guest operating systems can be run using the emulator including DOS, several versions of Microsoft Windows, BSDs, Linux, AmigaOS, Rhapsody and MorphOS. Bochs can run on many host operating systems, like Windows, Windows Mobile, Linux and Mac OS X.Bochs is presently running version 2.6.2. 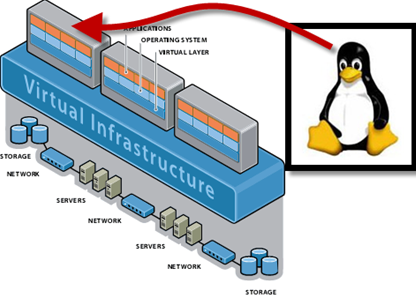 KVM is a Linux kernel virtualization infrastructure. Kernel based virtual machine presently supports native virtualization using Intel VT or AMD-V. A wide variety of guest operating systems work with KVM, including different flavours of Linux, BSD, Solaris, and Windows etc. KVM is included with Debian, OpenSuse and other Linux distributions. If you are a newbie on tech world, then the best KVM is best virtual machine for you. Linux VServer is is a virtual private server implementation done by adding operating system-level virtualization capabilities to the Linux kernel. Xen project is the leading open source virtualization project. Xen virtual machine can monitor for 32 / 64 bit Intel / AMD (IA 64) and PowerPC 970 architectures. It allows several guest operating systems to be executed on the same computer hardware concurrently. XEN is included with most popular Linux distributions such as Debian, Ubuntu, CentOS, RHEL, Fedora and many others. Oracle VM is based on the open-source Xen hypervisor technology, supports both Windows and Linux guests and includes an integrated Web browser based management console. Oracle VM features fully tested and certified Oracle Applications stack in an enterprise virtualization environment. Citrix XenServer is based on the open source Xen hypervisor, an exceptionally lean technology that delivers low overhead and near-native performance.